Big Gay Ice Cream Truck – New York, NY (@biggayicecream) – Food Truck Talk – Searching for the best foodtrucks! 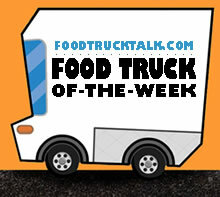 Congratulations to Big Gay Ice Cream Truck as FoodTruckTalk.com’s Food Truck Of-The-Week! I was recently visiting Hong Kong and was walking around the outside exhibits of the art museum, when I noticed a familiar site in the distance…. 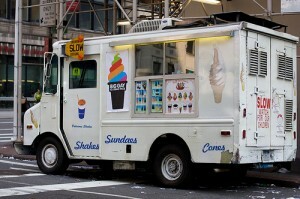 a Mr. Softee ice cream truck! 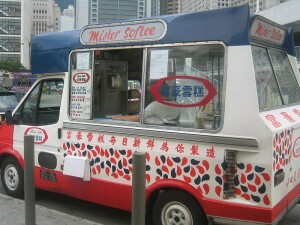 I knew American brands had made their way to Asia but I was suprised to see that Mr. Softee was one of them! 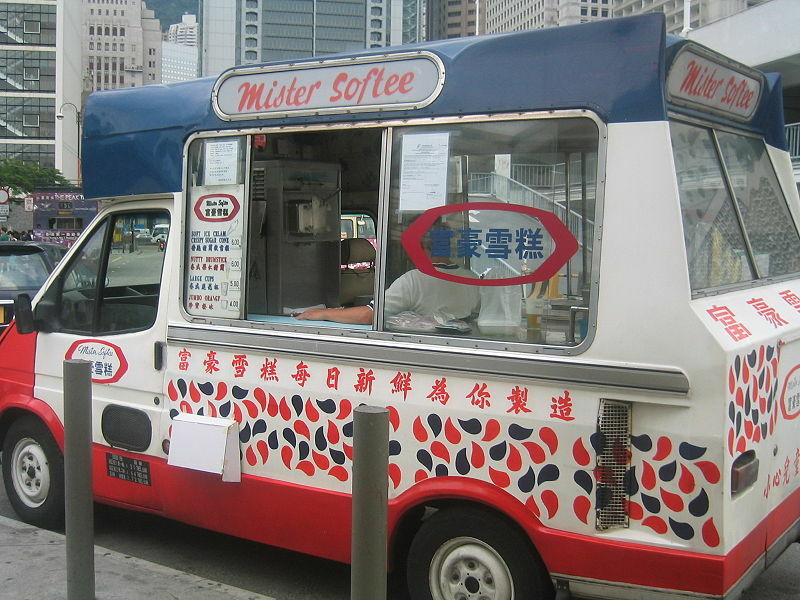 This Hong Kong version of one of my favorite ice creams did not live up to my expectations. However, one ice cream truck that exceeds my high level of ice cream quality is the Big Gay Ice Cream Truck. One of the great things about the “special” food trucks is that they often take a very basic concept and find a way to take it to the next level. This is truly the case with the Big Gay Ice Cream Truck as they have put their own twist on soft serve ice cream (get it, “their own twist!!!”). The Big Gay Ice Cream Truck was founded by Doug Quint (a professional bassoonist) and his partner Bryan Petroff. They have created some incredibly clever ice cream desserts that include a wide variety of toppings, many of which will suprise you. Since Thanksgiving is just around the corner let’s start with the Gobbler. 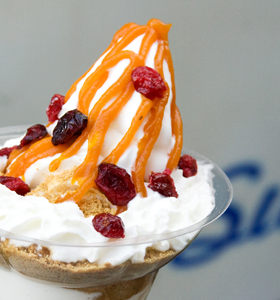 This ice cream sundae specialty starts with vanilla ice cream sitting on a bed of crushed graham crackers and topped with pumpkin butter, whipped cream and craisins. Hey, for Halloween pass this treat out to the kids in the neighborhood! THe Big Gay Ice Cream Truck guys have fun with their treats and the names of the treats. Care for a Salty Pimp? It’s a vanilla ice cream cone with dolce de leche, sea salt and then dipped in chocolate. How about the Bea Arthur, vanilla ice cream with dolce de leche and crushed Nilla wafers. I don’t know why this is called Bea Arthur, but I’m sure she would have approved. The Belgian Slipwich (ice cream sandwich) is vanilla ice cream on a bed of Nutella squeezed between two chocolate cartwheel cookies. Yum! Ice cream toppings include some unusual items including olive oil with sea salt, Trix cereal, cayenne pepper, wasabi pea dust, Nutella, ginger syrup, elderflower syrup, key lime curd, siracha (a Thai hot sauce) and many more! Check with Doug when you visit the Big Gay Ice Cream Truck and see if he has carmelized bacon on the truck, if he does he will create a very special and unique treat for you! Great ice cream and a lot of fun that is sure to put a smile on your face and maybe bring back memories of your memories of Mr. Softee, only the Big Gay Ice Cream Truck is like Mr. Softee on steroids!